Editions Mego label boss Peter Rehberg exhibits an enthusiasm for the noisy and for the unexpected that is probably unsurprising to those familiar with his output as PITA. He finds some joy in Skype’s hallmark inadequacies as our call breaks up, fractures and distorts repeatedly. Editions Mego, the excellent home to experimental sounds of anyone from Hecker to Klara Lewis and from Oren Ambarchi to Lorenzo Senni, recently released the debut album from NPVR - a new collaboration between Peter Rehberg and Nik Void, of Factory Floor. 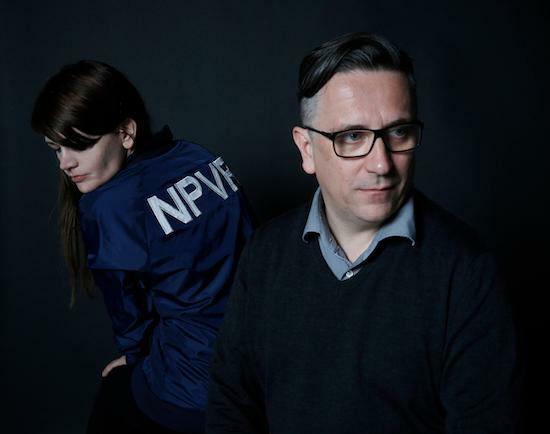 Void, who has worked with Chris Carter and Cosey Fanni Tutti as Carter Tutti Void, as well as with Gabriel Gurnsey as Factory Floor, recently debuted a new composition for Renegade New Classical, a night for Spitalfields Music Festival. Written for experimental orchestral ensemble s t a r g a z e, the piece was received with great enthusiasm, and is just one example of Void’s constantly shifting output. Both Void and Rehberg have an impressive list of collaborations behind them, and have now come together for yet another. 33 33 showcases a distinct and cohesive sound, despite the fact that it was recorded during their first sessions with one another. Across the foreboding ‘Twin Cases’, the twisting textures of ‘Free Founder’ and the peculiar timbres of ‘Meantime (Part 4)’, NPVR craft an exciting array of shapeshifting sounds. Working tirelessly, the two started their second album before fans even got to hear the first. I catch up with them to talk about what it’s like for them to work together, how music zeitgeist has changed in recent years, and making decisions while making music. How did your collaboration first come about? Peter Rehberg: I approached Nik about doing a record for my label and she said yes! And then she suggested that we make a record together, and I said yes! Nik Void: We met first at Cafe Oto where I was playing with Klara Lewis and we realised we work with the same gear. I’ve been a fan of Editions Mego for a long time, so when he suggested I put a solo record out, I was pretty overwhelmed. I suggested, as we have the same setup, that maybe we should do something together and he was just like, “Yeah.” It was as easy as that. MZ: So what was it like when you met up to work? PR: It was great! It was very fluid, very natural. It wasn’t like being put together by a curator or a festival. We just jammed and made some good tracks. NV: I have to say though, Peter, you made it very difficult for me. I like to prepare, and when I arrived with a prepared Ableton session - as soon as he saw me get my laptop out - he went, “no laptop.” I was totally thrown in the deep end. I wasn’t expecting to work without a laptop though, that’s my safety net at the moment, so it was hard. PR: I think it’s good to work without the laptop, or without a safety net. I wasn’t deliberately trying to be harsh - I just think music should be a little bit unsafe. If we did use the laptop, then it would be just another laptop album. NV: It does make you think differently about your approach. There were times where we basically played nonstop for like four hours, and I’d think, “is this making sense?” I couldn’t work out who was making what sound, but it just seemed to work. We managed to work through four hours solidly without realizing that that much time had passed. Was it hard to sift through all that material to determine what would be on the record in the end? PR: What ended up on the record got chosen on the second day, but over the following weeks, we cut that down by around half. You have to be really, really strict. If something doesn’t click, throw it away; it’s not a special way of making music. There were a few minor edits done afterwords, and that was it. A bit of back and forth, a few suggestions, and then we came up with some titles. You both work collaboratively a lot - I guess Nik just answered what I was going to ask next, but Peter, what did you enjoy about working with Nik? PR: Well it was refreshing to work with someone using the same technical setup as I have. My main collaboration is with Stephen O’Malley [of Sunn O)))], who plays the guitar. It’s interesting to play with a guitarist, but there’s a lot of, “How can I hear myself if I don’t have an amp,” or “How does this work tonally?” Here, we were plugged in through the same boxes, more or less, clocked together by one sequencer, so off we went. It was refreshing, interesting, nice and quick. Which is not to say that working with different instrumentalists is bad - this was just the most interesting part of it. NV: Yeah, when you work with a guitarist as well as with modules, you have to figure out where your space is sonically. The great thing about us both using modules is that it feels like they’re having a conversation together. What draws you to working on so many different projects with so many different people? NV: I’ve never seen myself as someone who works on their own, I’ve always appreciated and been interested in the ways through which other people approach their work. I like to throw myself out of my comfort zone and work in an improvisational way. Working with other people is more of an enjoyable process. Are there any artists on your radar right now that you’d particularly like to work with? PR: Just fanboy ones - most of them are dead now, unfortunately. I don’t actually think about it, really, it just comes about. I liked this project, for example, because it’s one we decided to do. Many collaborations come from two managers having lunch together, or festival curators trying to spice things up. I find those to be a bit forced. Who would I like to work with? Whoever comes along. NV: Same with me, I think it’s more about the situation. I’d like to do more work with visual artists - I’m going to be working with Haroon Mirza again, using his exhibition to give me ideas for sequences, and things like that. Working with an artist from a completely different discipline is a great way to move forward with your own process, because you don’t know how their mind works. In terms of a specific person though, I couldn’t really think of one, it always comes about through different circumstances. You both seem rather tireless in the way that you work, considering your output. What have you heard recently that have made you feel excited about music? PR: I’ll be biased and say the things I put out. I’m interested in how music has become - I don’t know if this is the right word - democratic. Right now we’re in a kind of post-scene thing. There are so many different kinds of music that are all valid, whereas in the ‘80s or ‘90s, you had to be into this sort of thing, or that sort of thing - it was a bit tribal. Now, it’s much more open. NV: That’s a great thing. It feels a lot more universal and different to growing up in Britain or living in London in the mid-2000’s. Scenes were very big. That’s why I started to spread myself out and collaborate, inviting people from elsewhere to work with me. This allows things to be thrown at you from any direction, so you don’t end up following one ‘tribe’. Peter, you say you’re really decisive when you choose music for the album, how do you go about that? Do you have a clear idea of what you want? PR: It’s just instinctive, I think. You immediately go, “That sounds good,” or, “That doesn’t.” You just have to be deliberate; I’m not into this idea of spending hours in front of a computer editing, and falling asleep. I like to do it and have it done, though sometimes there’s a bit of processing after. NV: Do you think that comes from experience as well? I mean obviously you’ve listened to a lot of records, and maybe you know what you want. PR: Sure - in my years as a label head, I’ve developed an interesting capacity to say, “Oh that’s good,” and not be too pressed about any one thing. I mean, you’re not throwing it away, really. It’s not going in the bin, just a folder somewhere. I’ve got terabytes of unused data, and this lets you move on. You never feel nostalgic, or second guess your decisions? PR: No, I probably just forget about the material. What about you, Nik? I get the impression that that’s not really the way that you work. NV: I like to work with a structure, like a beat, and work over that with various loops until things naturally fall into place. But many recordings that I do, and many that I enjoy, don’t have any compositional value. [LAUGHS] It’s just down to randomness, from it’s extended techniques with guitars, to feedback. You can’t totally determine what’s going to happen. You can’t anticipate exactly how it’s going to work when you start put this small group of modules together, and I really get excited about that. When I’m working with a direct structure, like with Factory Floor, it’s easier to put experimental sounds into that framework. With Peter, whose approach is completely freeform, some of the sounds still end up really working well together. Like with ‘DEABG’, the last track on the album. At first I found that quite uncomfortable to listen back to, but now that’s my favourite and I’m really excited about reinterpreting that live. We want to play live, and of course we aren’t going to play straight from the record. It’s going to be something completely and entirely different. What are your plans on that front, then? PR: I think playing with modulars is a really interesting tool, because for years I was working on a computer and could save everything. With a modular, you can’t. You can remember a patch and try to recreate it, but it always sounds slightly different. It’s quite refreshing for me. I’m quick at editing, but I do spend quite a while mixing - especially when working with Stephen O’Malley [as KTL] on our last record. It’s taken four years and still isn’t finished! There’s that approach as well. When Nik and I start to play live, of course we won’t be doing the album, as that was recorded in a specific time and place. So you’re planning live shows? PR: Yeah, anything. Weddings, bar mitzvahs, funerals [LAUGHS]. I do think that’s the next stage though. All the music you hear is live music, it’s played in real time, so I think it makes sense to take it on the road and play it to people. NV: The modules dictate a certain sound, and we’ve also got sampling modules that I keep using too, so there will be similarities. I went to Vienna recently to work on the follow-up record with Peter, and it’s still using a few of those samples. I’m trying to figure out how they change or how they keep the identity going. That’s a lot planned already. Anything else up your sleeves? PR: Well, I think that’s enough for now. Don’t get too excited!